Founded in the year 1988, we have grown today as Asia's biggest network of skill training provider in Computer Aided Design (CAD), Computer Aided Engineering (CAE), and Project Management. We host a wide array of courses, certifications, placement assistance and career planning tools to help students get the most from their education. We have nurtured careers of over 1.5 million engineers, graphic designers, and management professionals each touching heights across the world. We enlist most sought-after courses for everyone – designer, drafter, administrator, or a programmer. We help students add value to their career with globally recognized training and certifications. We provide experienced and professionally qualified tutors creating an excellent learning environment. We conduct timely seminars/workshops aligned with the professional disciplines to enhance skills of the candidates. Under the administration of Ministry of Skill Development and Entrepreneurship, CADD Centre and National Skill Development Corporation (NSDC) work in collaboration to develop skilled professionals for tomorrow. Also, we have partnered with Ministry of Micro, Small, and Medium Enterprises (MSME) to upskill our candidates for grabbing job opportunities in this sector. We also offer extended financial support for the students. CADD Centre has signed an MOU with SBI allowing students to get skill loan for any course. 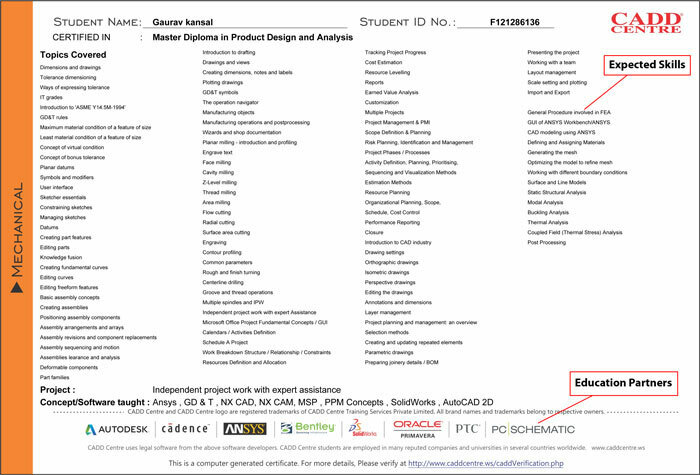 CADD Centre’s Curriculum and Product Development (CPD) team strives to deliver the best courseware for the students. From beginner to advanced levels, every resource reflects highest clarity & standard. The Internal Training Academy (ITA) brings together certified instructors who monitor the quality of training programs regularly. As only ITA certified instructors are allowed to lead a classroom, the CADD team delivers nothing but the standardized training across the world. On completion of a course at CADD Centre, a course completion certification is endowed with the name and course particulars of the student. The certification is accredited by NSDC helping student’s skills get more recognition across the world. 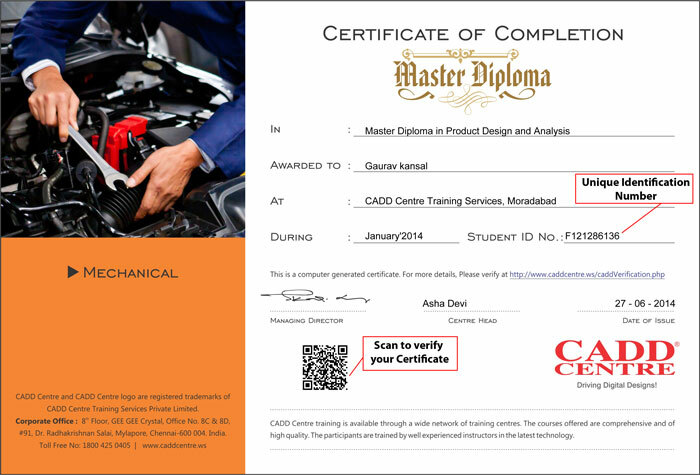 A Quick Response (QR) code is provided to prove the authenticity of the certification which can be verified online with the student identification number. Best in Category - Education' Award from Franchise India Holdings Ltd for 2010. Won Award for "Business Leadership" for 2012 from Franchise India Holdings. CADD Centre being ranked amongst Top 100 franchise Opportunities for the year - 2014 by franchise India Holdings. In 2016 CADD Centre recognized as the "Best International Organization in Skill Development" with Silver Trophy by ASSOCHAM, India. ASSOCHAM recognizes the Skill Development efforts second time consecutively with Gold Trophy in 2017. "THE MOST ENTERPRISING BRAND OF THE YEAR" for Skill Development Training in Design for engineering by WBR - Brand Management Consultancy in 2018. CADDZoom Monthly newsletter SUBSCRIBE NOW!